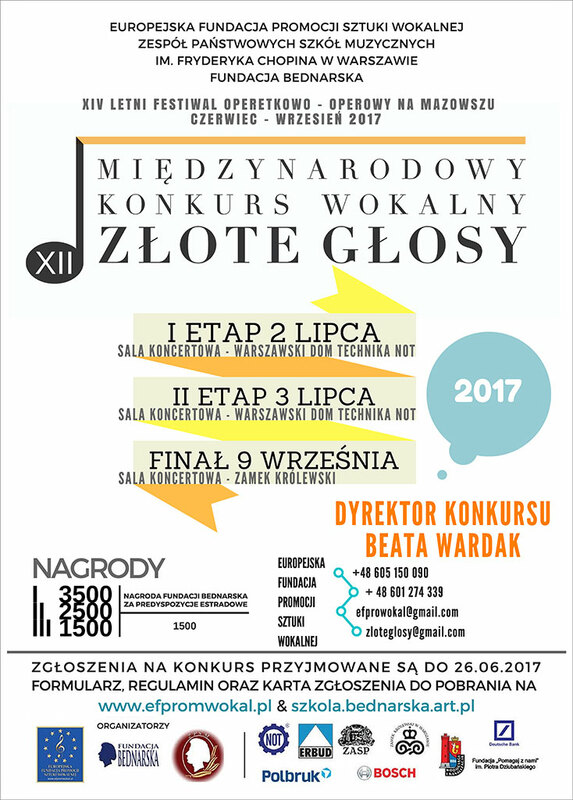 In 1883 the Warsaw Music Society, under the presidency of the famous Polish composer Stanislaw Moniuszko, decided to establish its own music school. 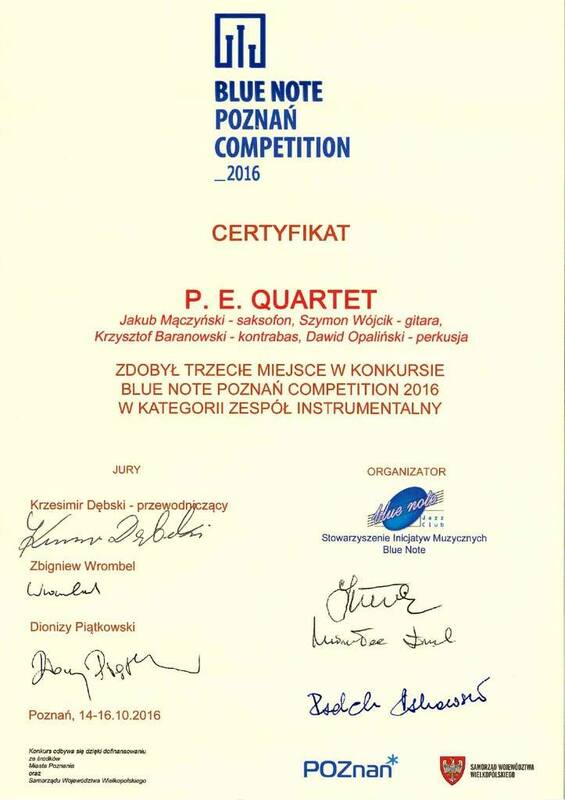 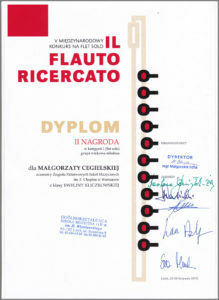 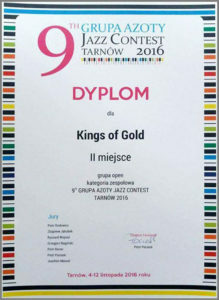 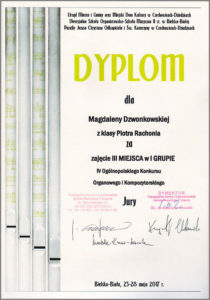 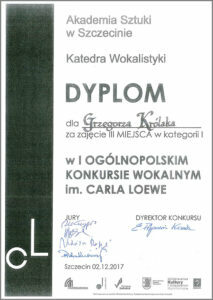 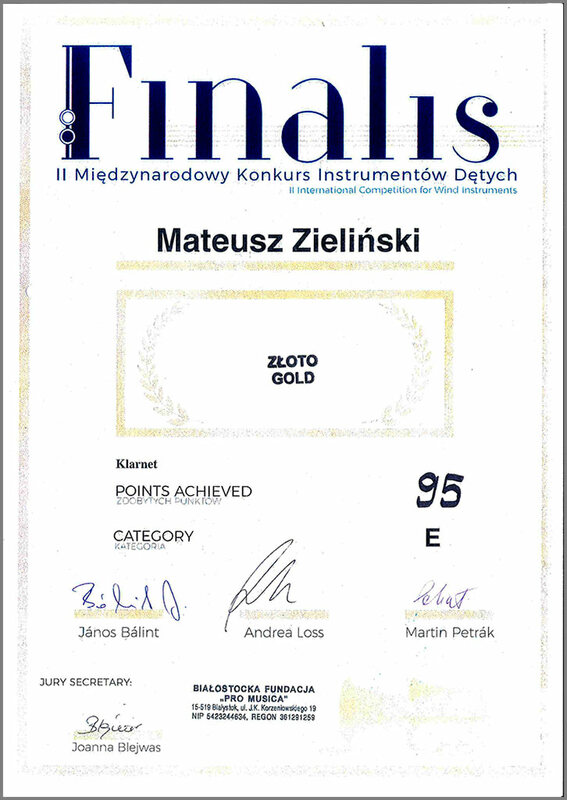 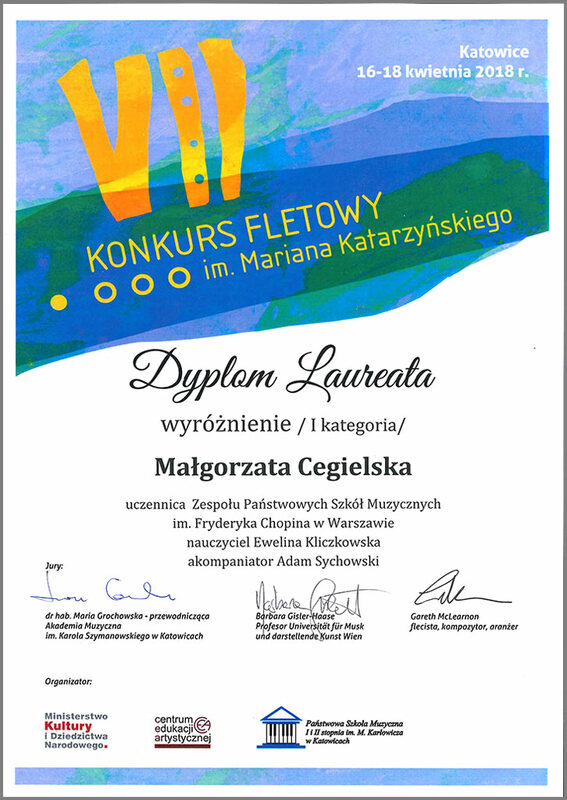 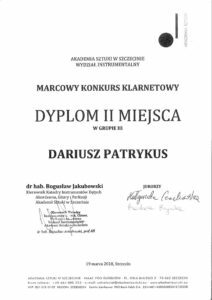 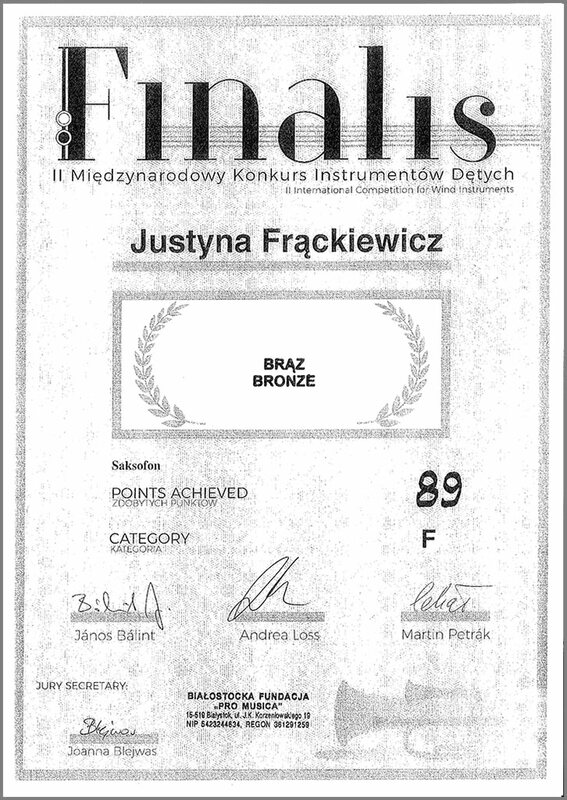 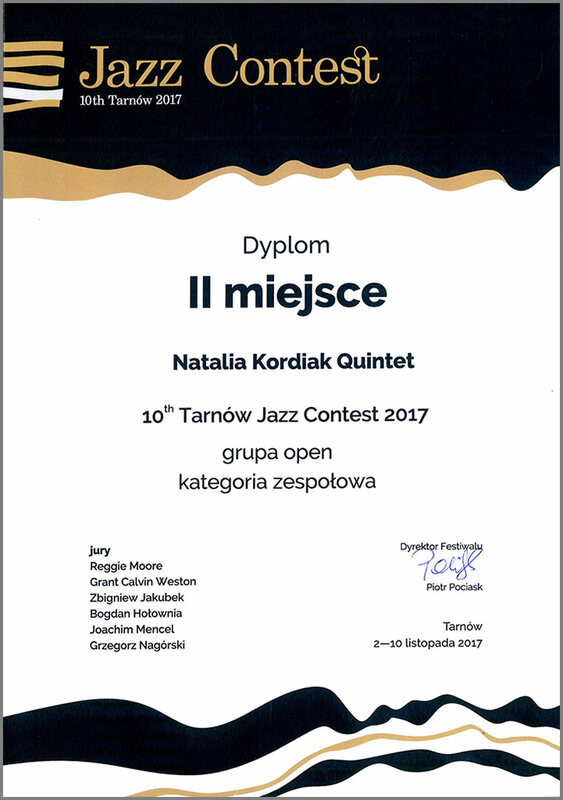 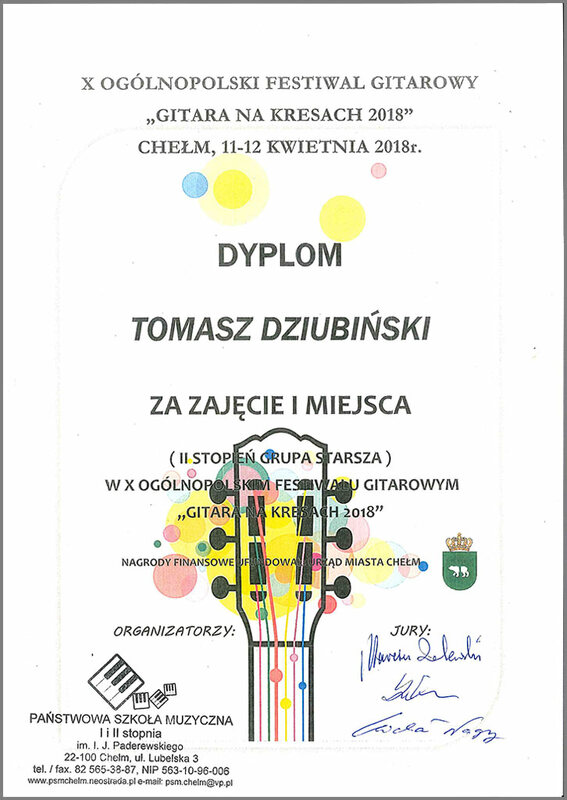 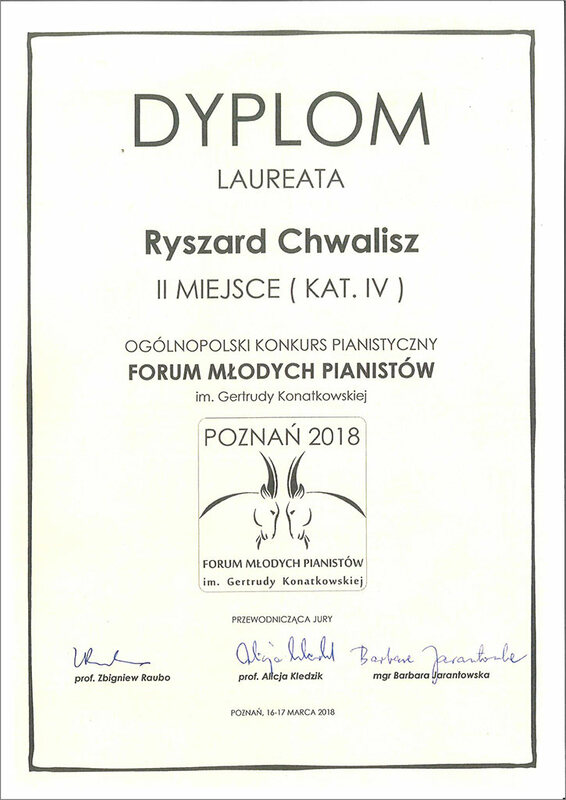 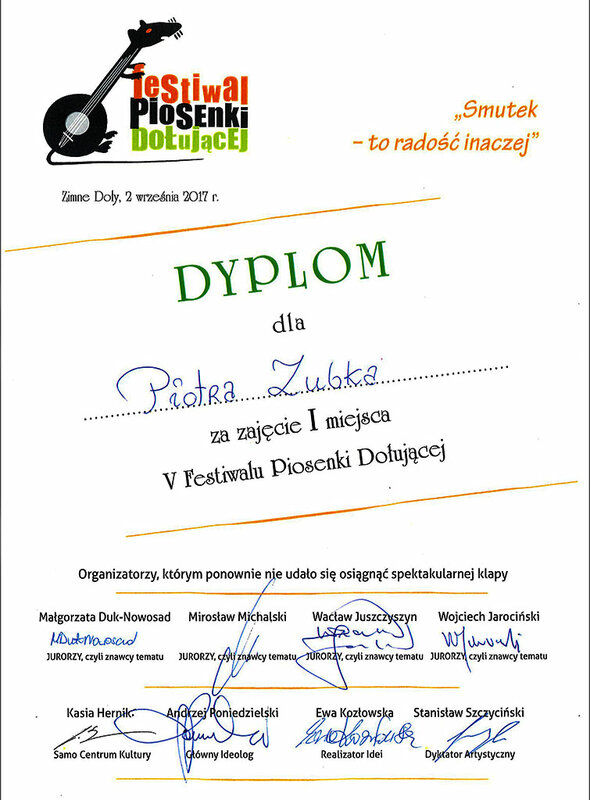 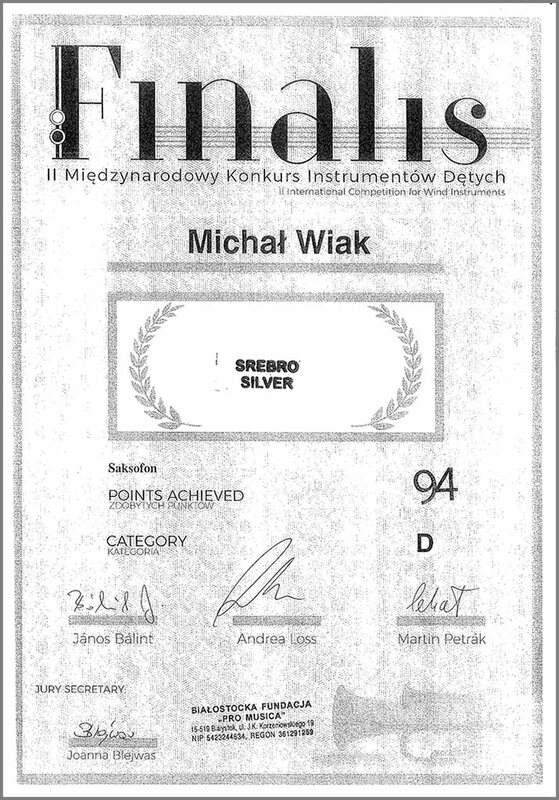 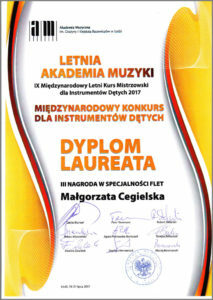 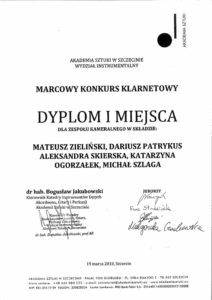 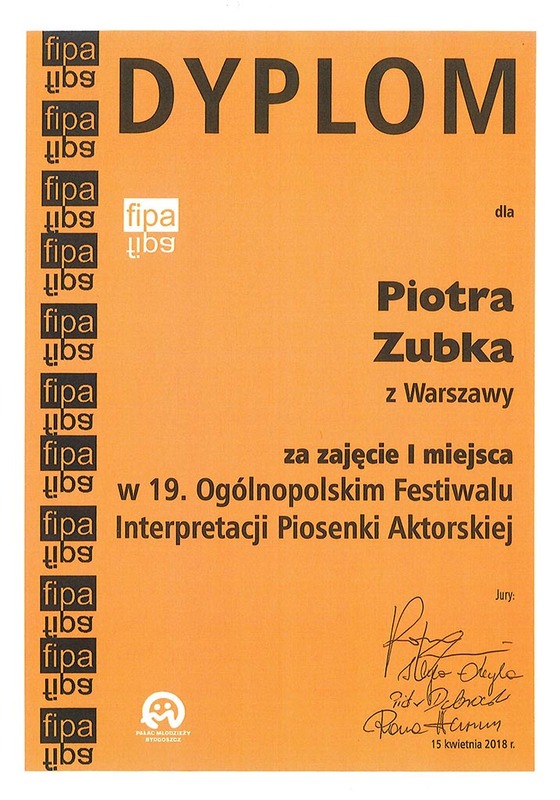 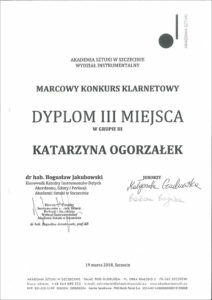 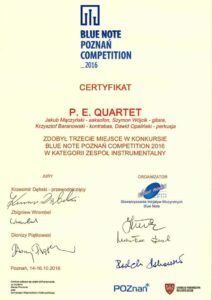 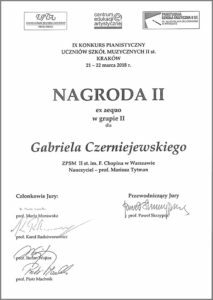 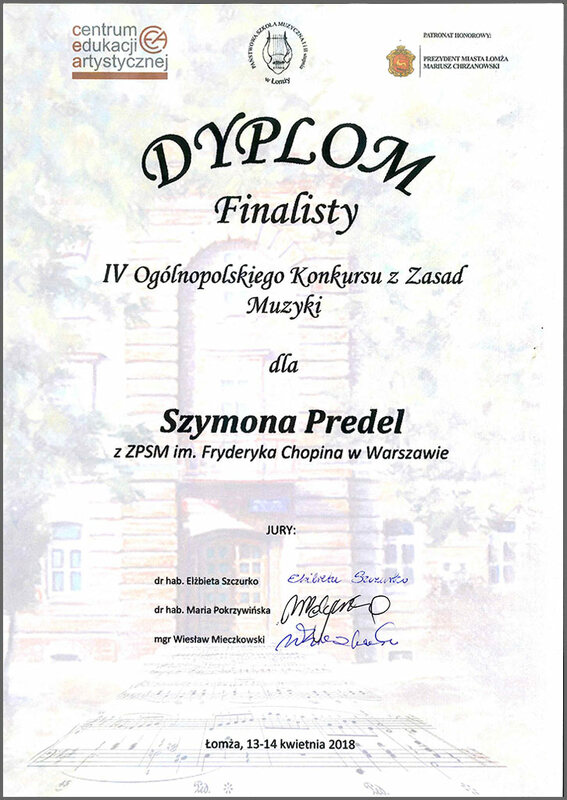 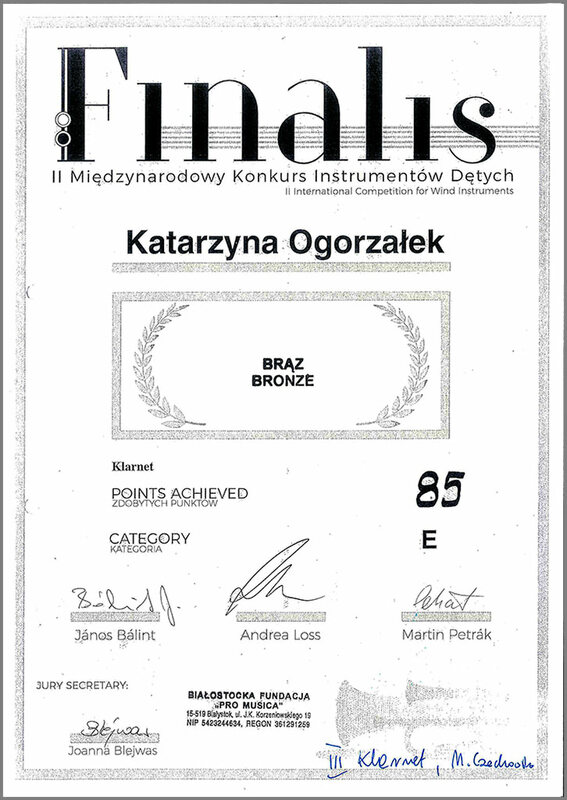 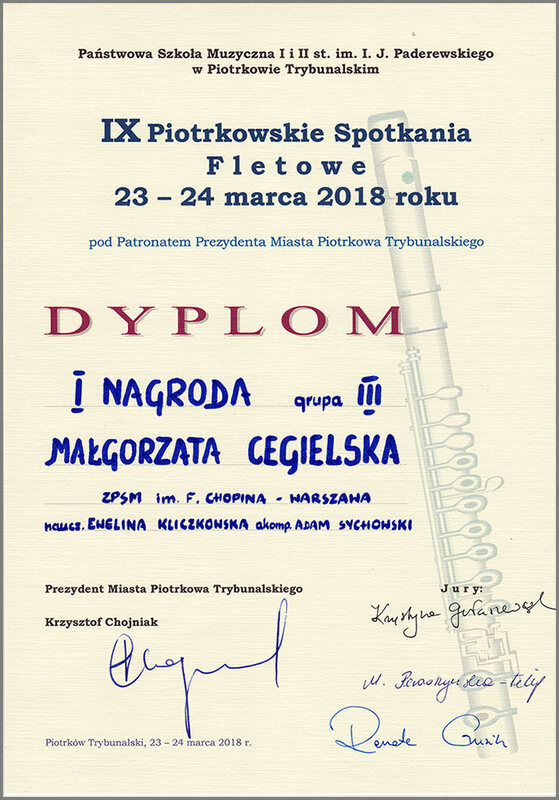 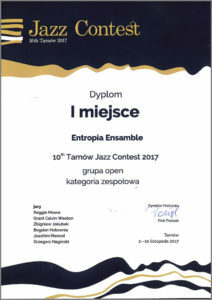 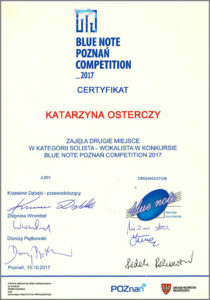 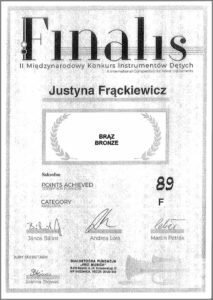 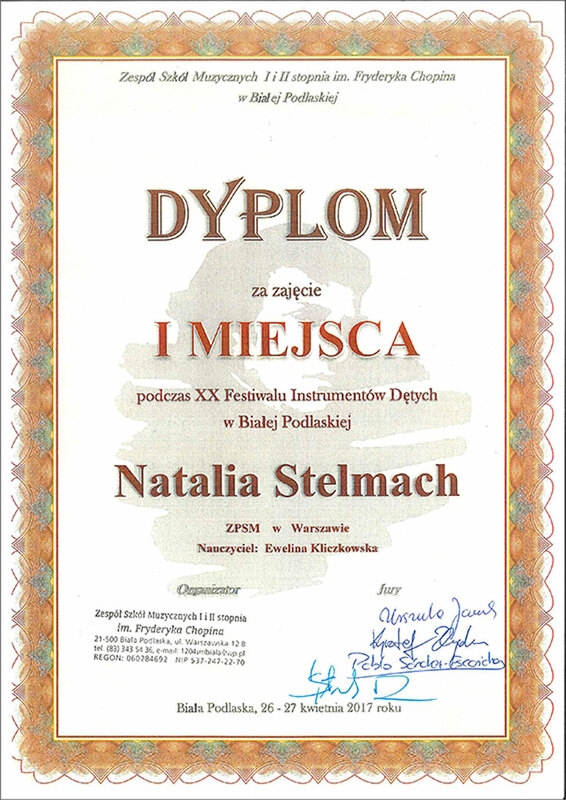 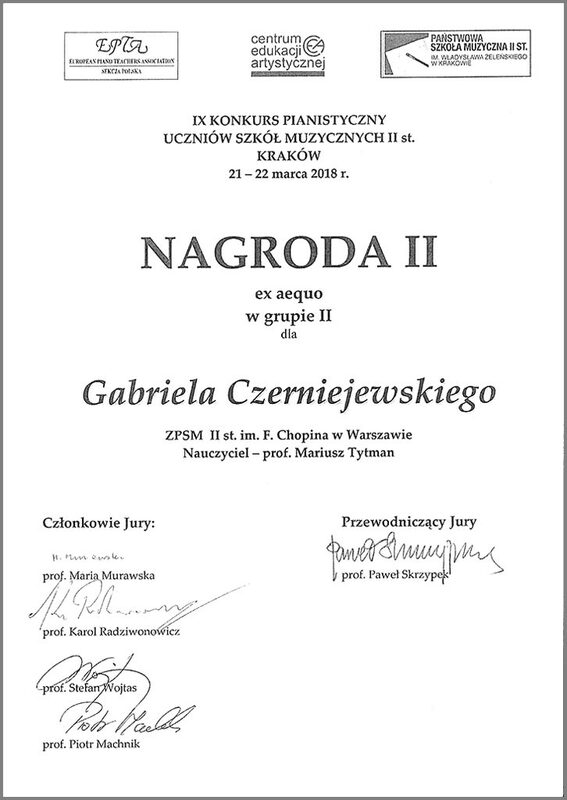 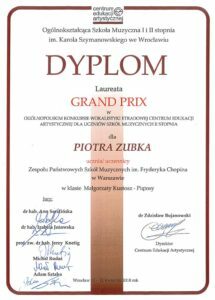 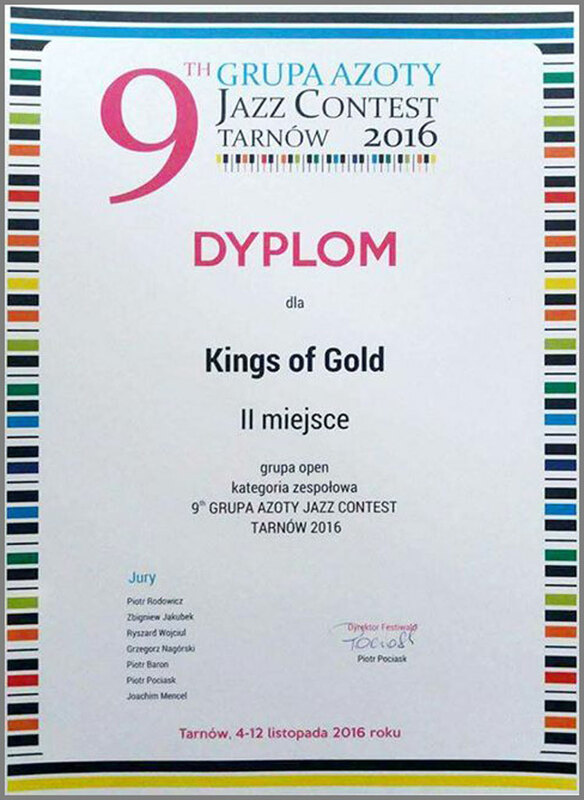 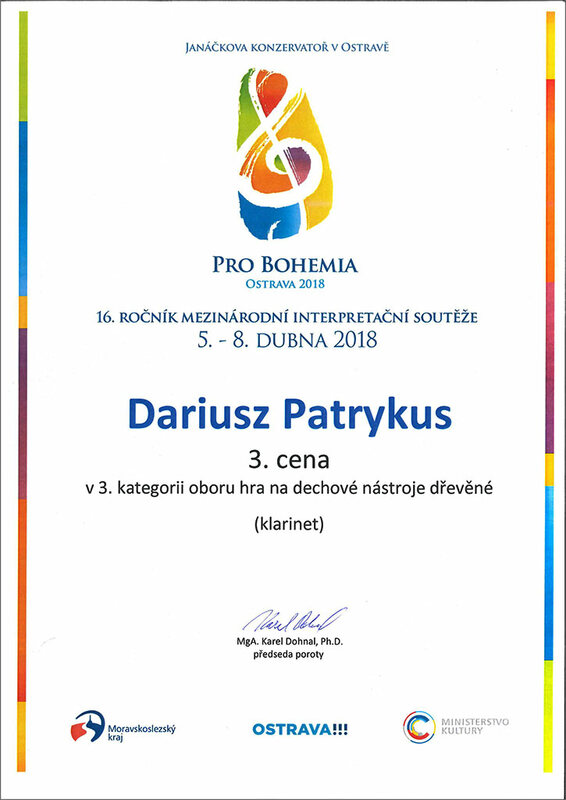 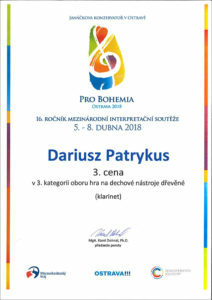 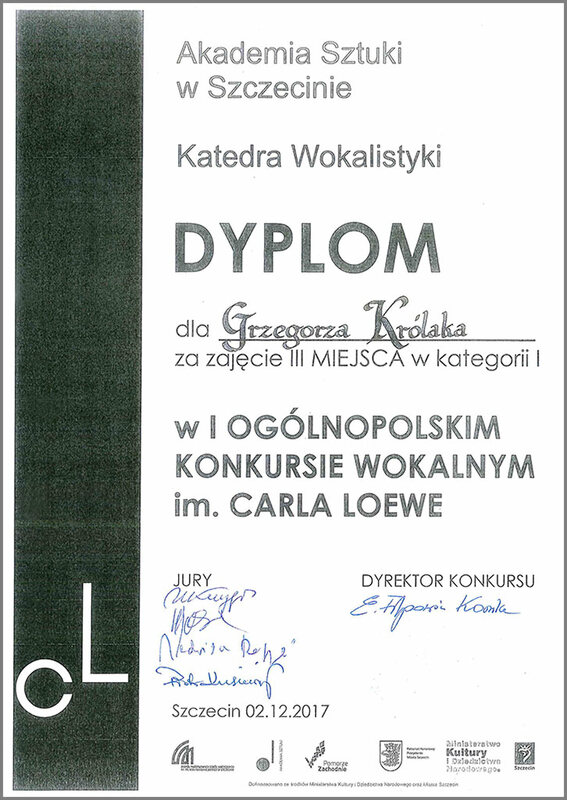 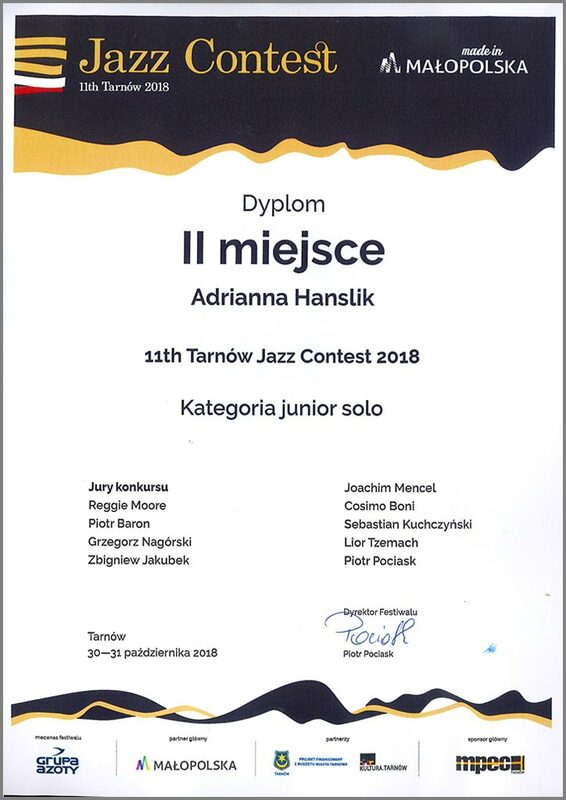 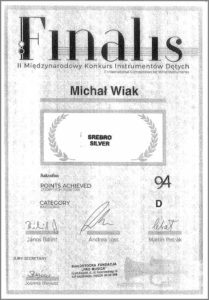 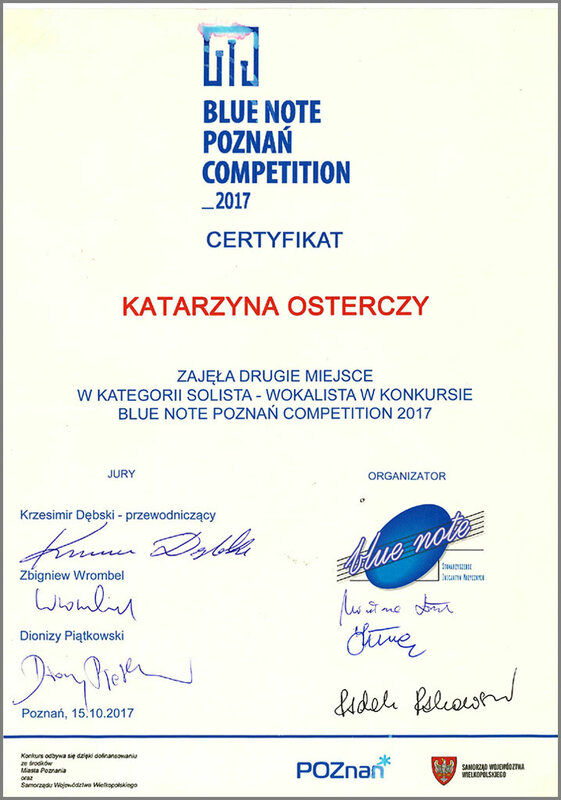 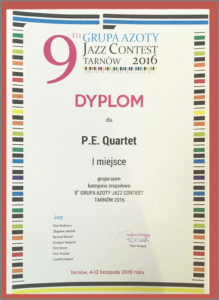 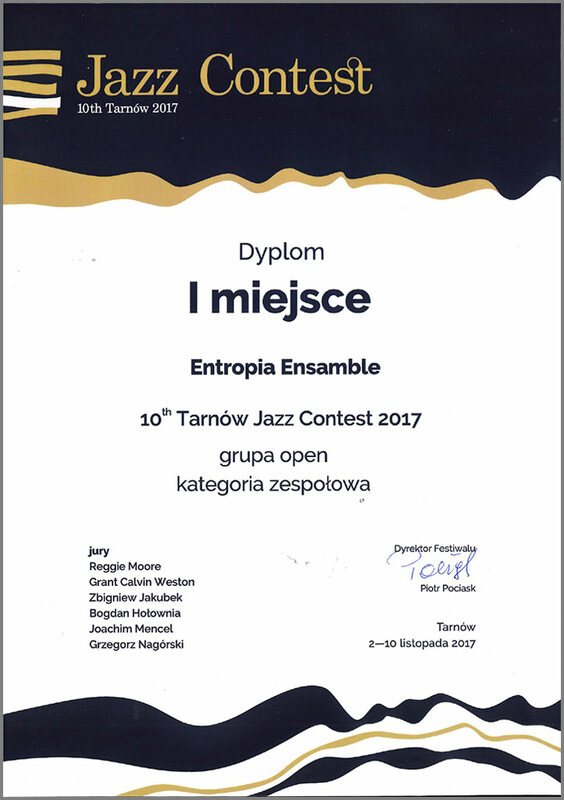 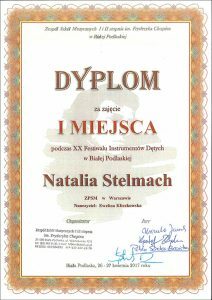 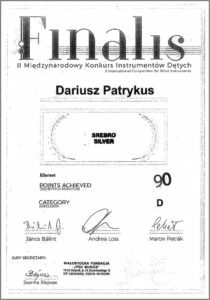 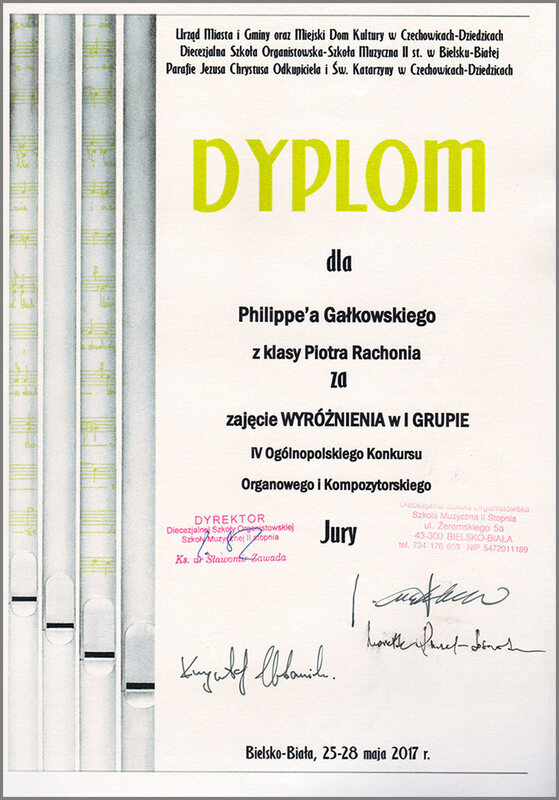 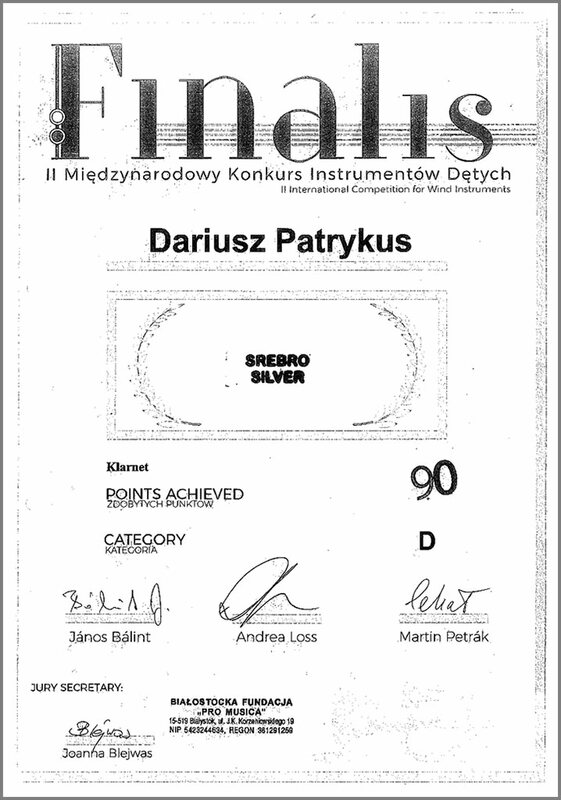 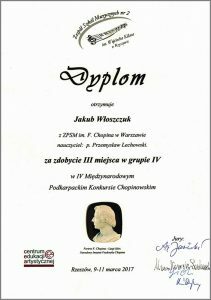 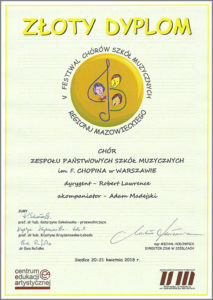 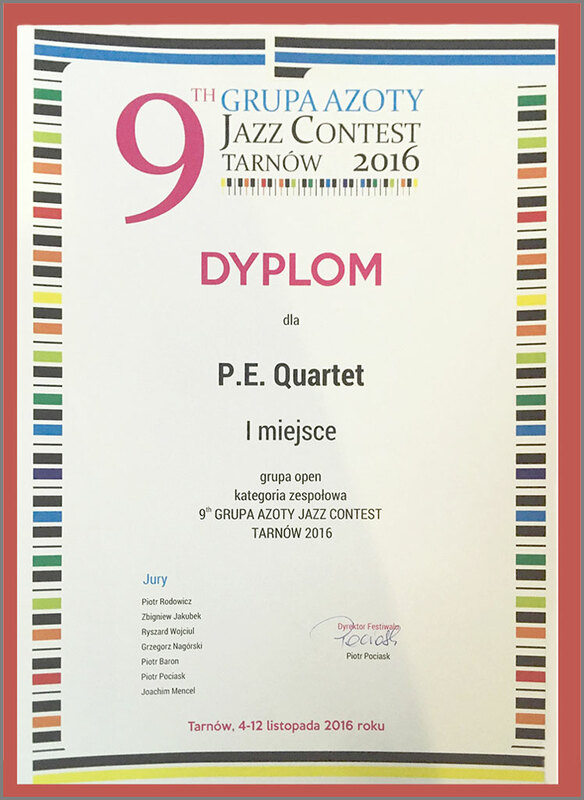 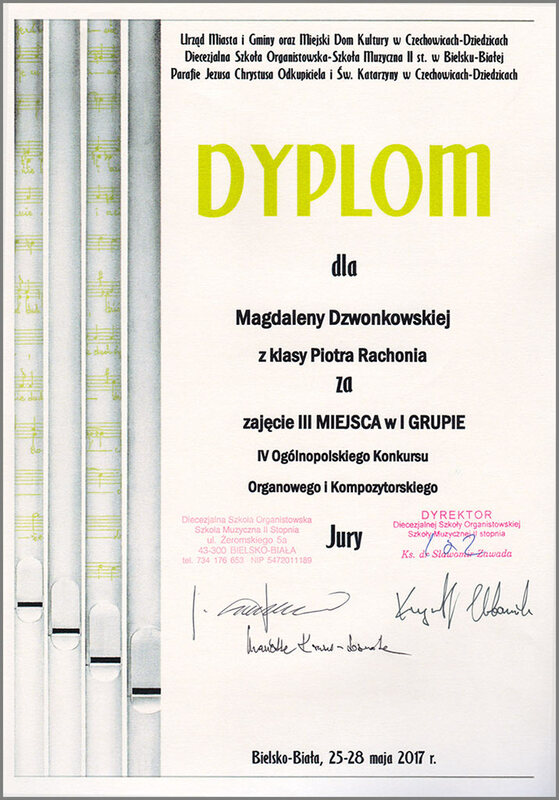 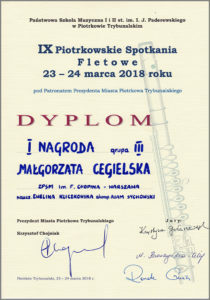 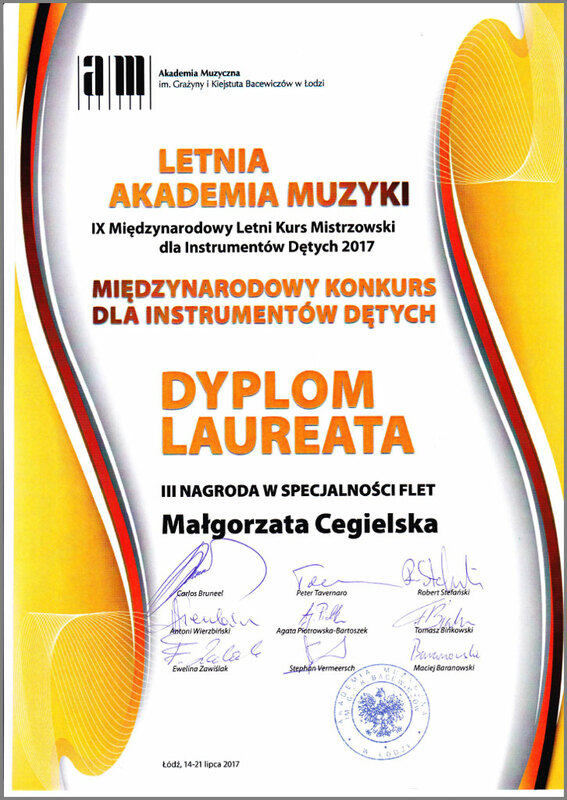 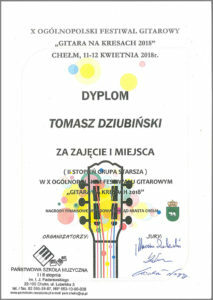 The school diplomas were recognised as official licences, giving the status of a professional musician in both the Kingdom of Poland and the Russian Empire. 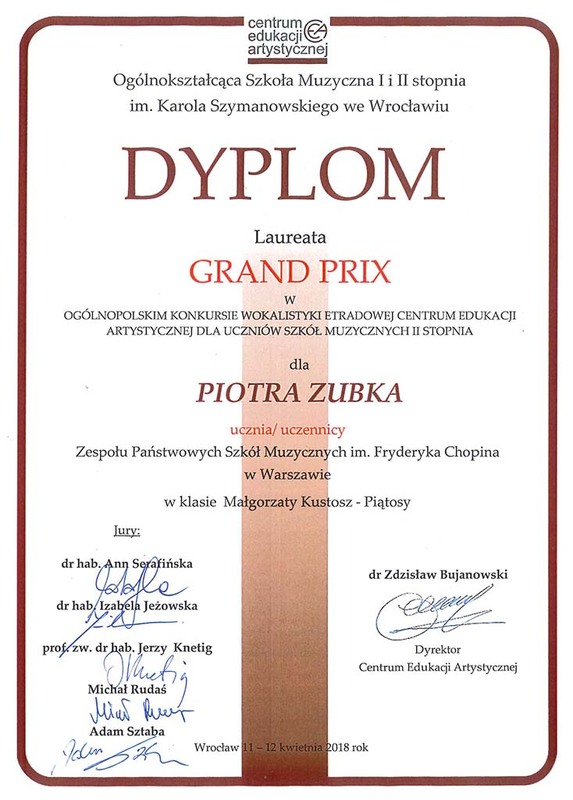 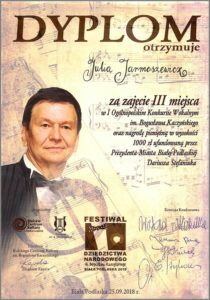 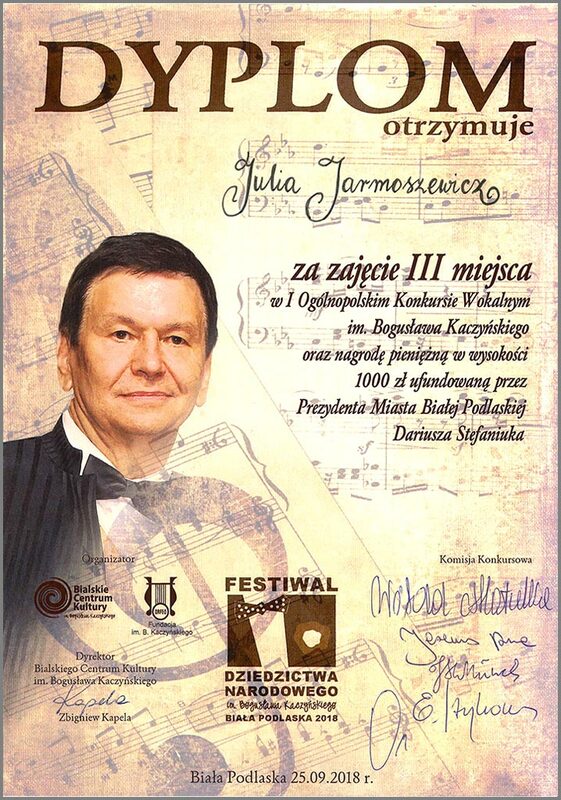 The School directed by the composer Piotr Maszyński included classes of solo and choir singing, classes of wind instruments, cello, organ, piano, and violin, also harmony, counterpoint, and music forms. 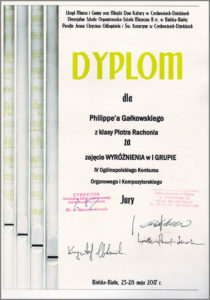 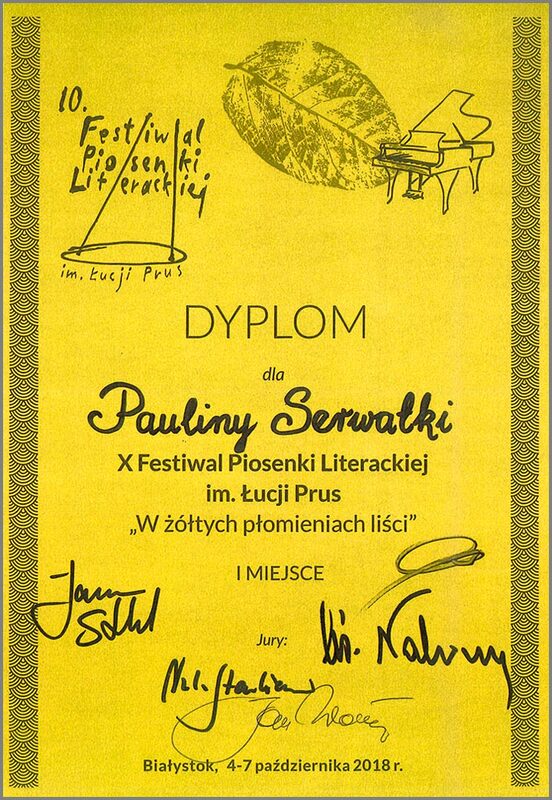 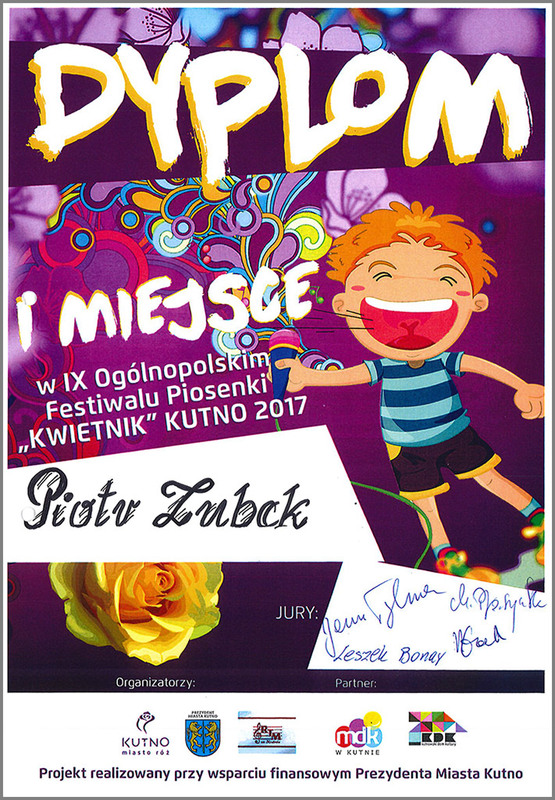 A few years later, Wiktor Piątkowski organised the classes of diction and declamation. 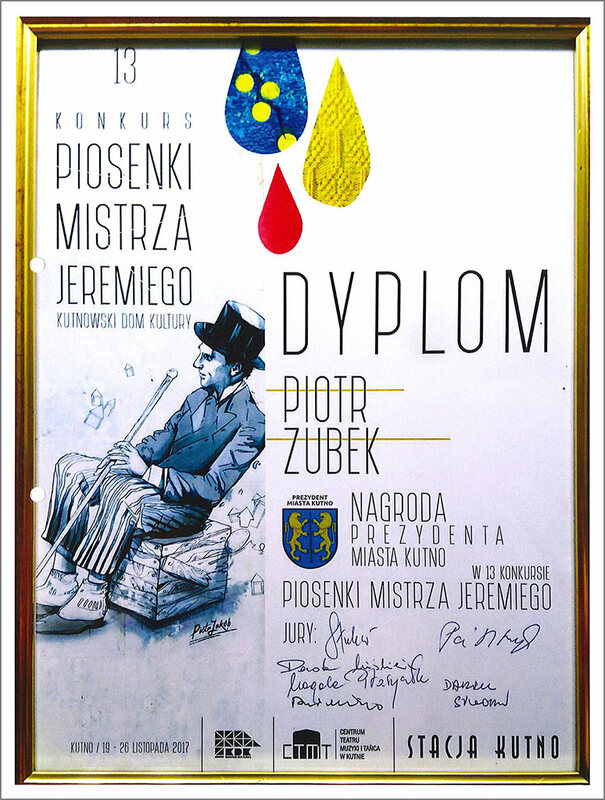 This specialisation flourished from 1905 to 1916, because it was the only Polish language drama school in Warsaw. 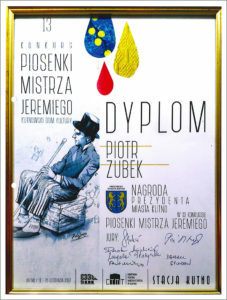 The best Polish actors of the period were its pupils, to list only the famous Helena Modrzejewska (Modjeska), Mieczysław Frenkiel, Jozef Kotarbiński, Wincenty Rapacki, Władysław Szymanowski, Roman Żelazowski, Maria Przybyłko - Potocka, Stanisława Wysocka, Antoni Fertner and Aleksander Zelwerowicz. 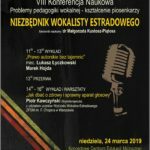 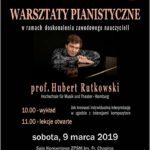 It is worth to note that during 1892-1897 the School has one of the most prominent Polish composers, renowned writer and establisher of the National Philharmony - Zygmunt Noskowski - as its Director. 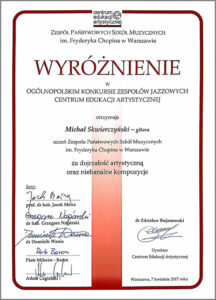 The School reached the highest European level of musical education and was a genuine counterpart for the Warsaw Conservatory. 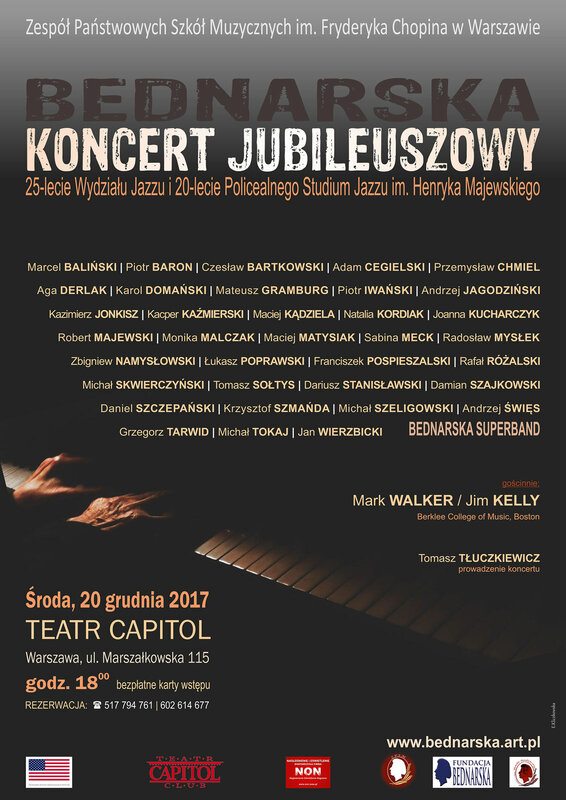 In the beginning the School was placed in the Great Theater ballrooms ("Sale Redutowe"), during following years changed locations till 1909, when finally received a steady venue in the new Warsaw Philharmonic building. 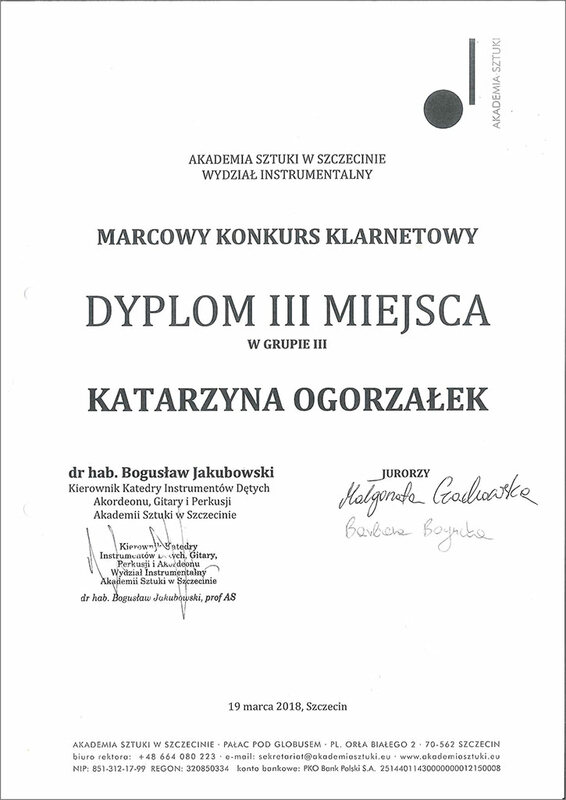 Teaching scheme included three courses: the lower, the intermediate and the upper one. 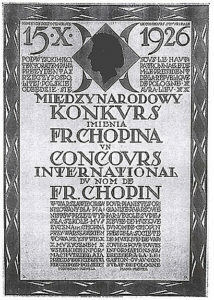 In result of growing success and achievements, in recognition of its distingushed role for the national culture, the School was granted official name of the "Frederic Chopin Higher School of Music " in 1919. 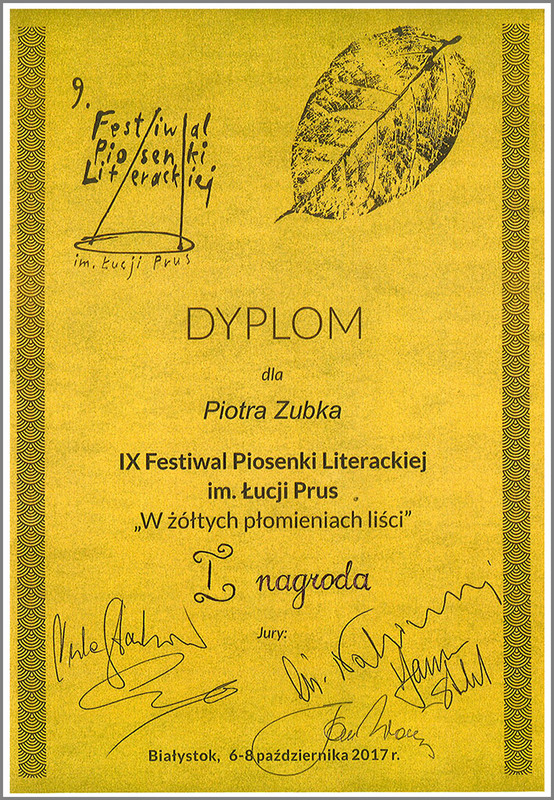 Between World Wars the School was in its blooming period. 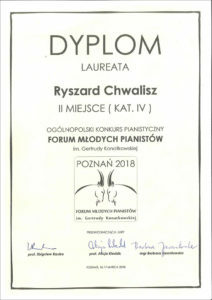 It flourished mainly by dominating piano classes taught by such artistic and pedagogical personalities as: Bolesław Wojtowicz, Aleksaner Michałowski and - above all - Jerzy Żurawlew. Violin classes were developing too, especially when Adam Wieniawski worked as School's Director. 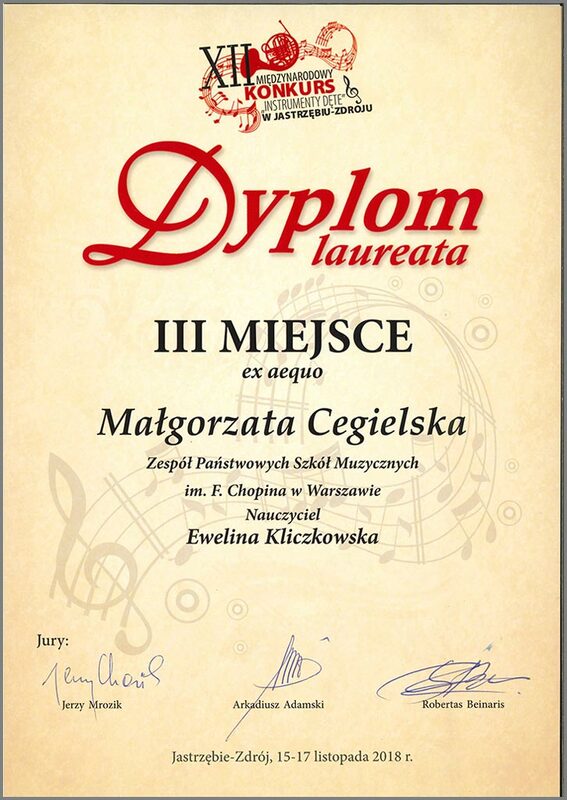 At the same time organ and vocal classes became famous, as well as classes of composition and orchestral conducting. 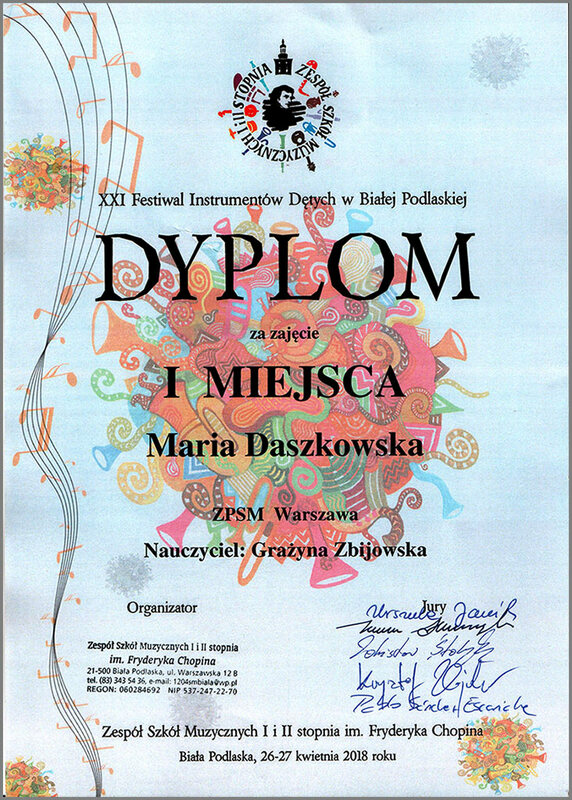 The School was known for its ambitious projects - for example the first exchange students' concerts, presenting achievements of various higher schools of music in Poland. 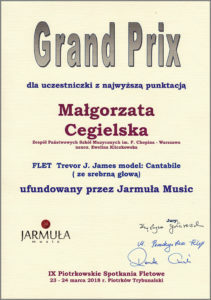 It also was a venue where two most famous, still existing international music competitions were born. 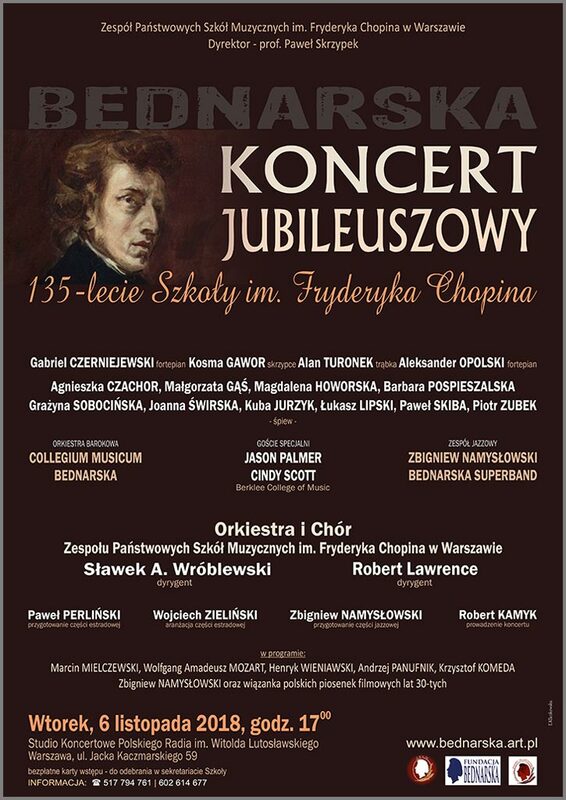 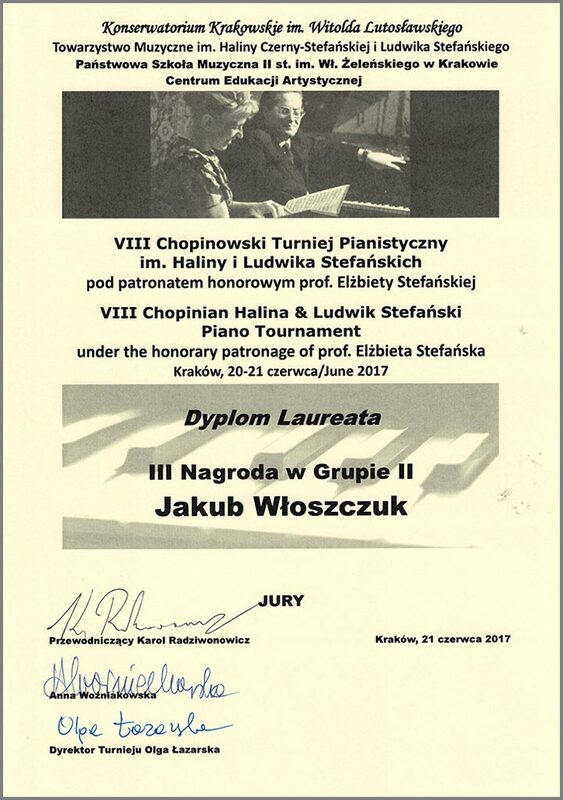 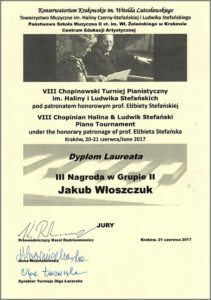 Following initiative of Professor Jerzy Żurawlew School started the International Frederic Chopin Piano Competition in 1926 and following Adam Wieniawski's idea - International Henryk Wieniawski Violin Competitions in 1935. 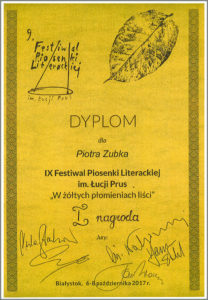 These two events made the School famous around the world. 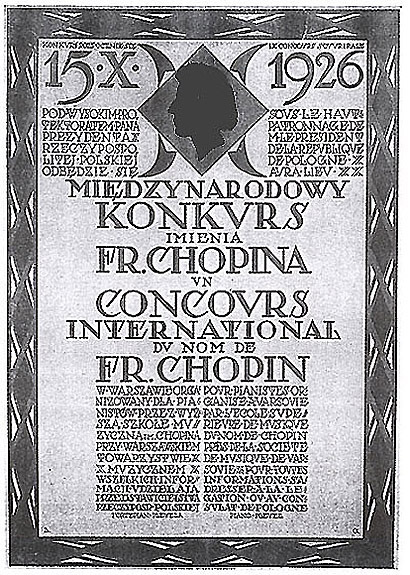 Not many people realize today, that these two, major international music competitions were established at the Frederic Chopin School of Music in Warsaw. 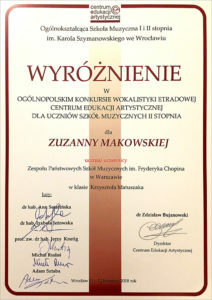 The Second World War didn't break activity of the School. 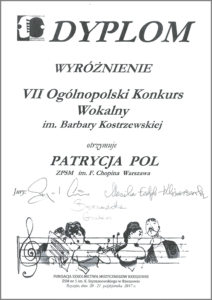 Despite of serous damage of Warsaw Philharmony building, where the School was sited, teaching was continued. 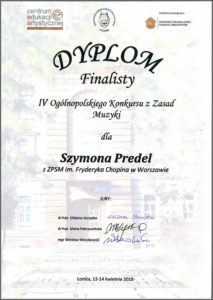 Towards the end of 1942 occupying German authorities closed the School. 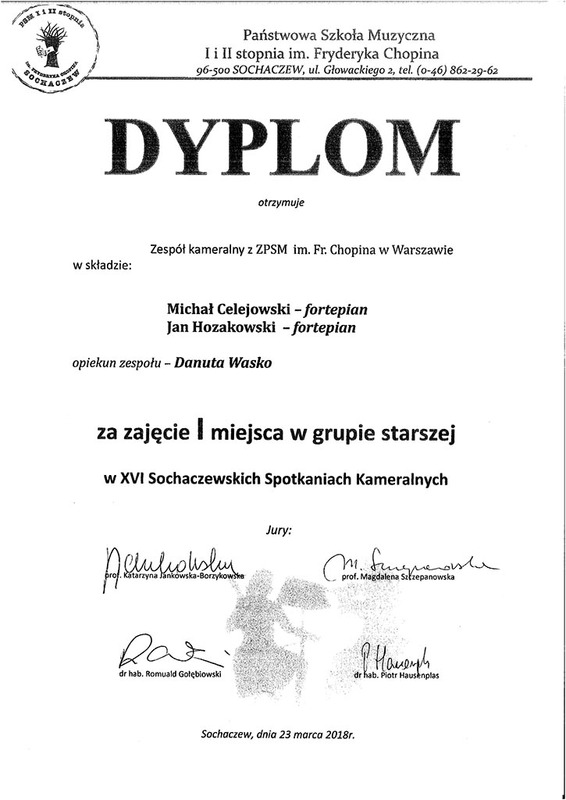 Soon afterwards it started to work in conspiracy. 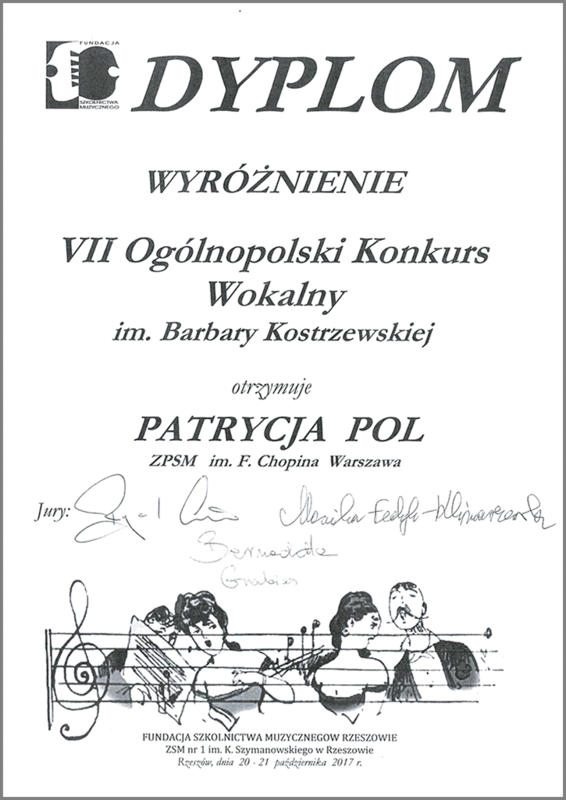 Concerts and lectures, which helped the nation to survive, stand the test of time and save its cultural identity were arranged. 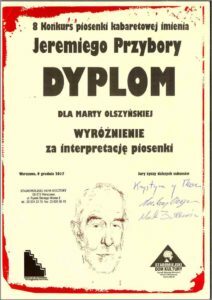 Regular lessons were started as soon as during Warsaw Uprising in 1944. 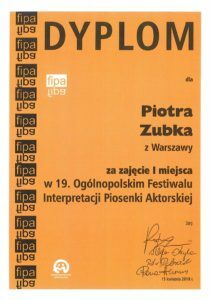 They were held in a temporary venue found in less destroyed Praga, on the right side of Vistula River. 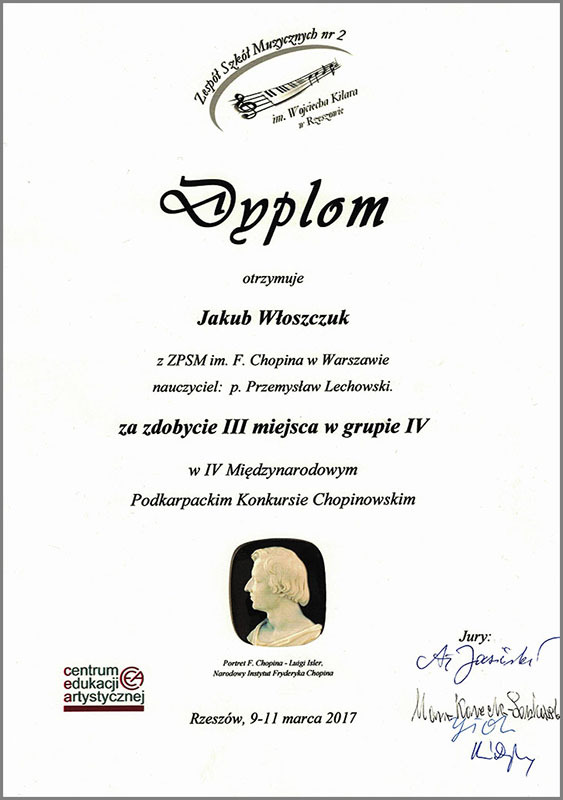 In 1945 Adam Wieniawski became a School Director again. 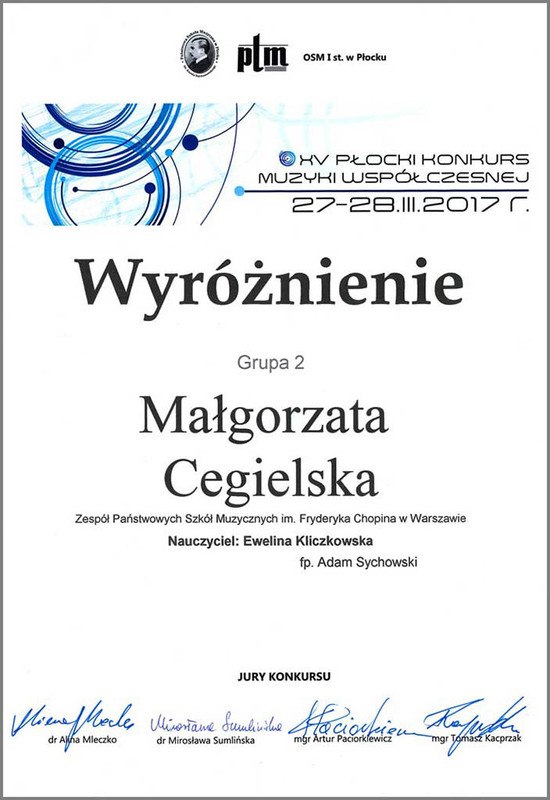 Following growing interest many branches of the School were established in Warsaw and in surrounding suburbs. 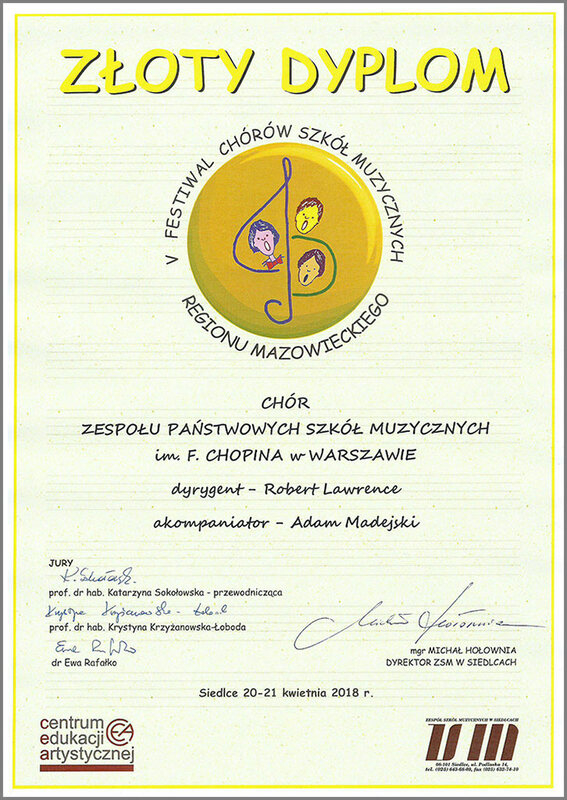 In 1950, during Stalinist rule, the School was nationalized and officially named the "Frederic Chopin Secondary School of Music". 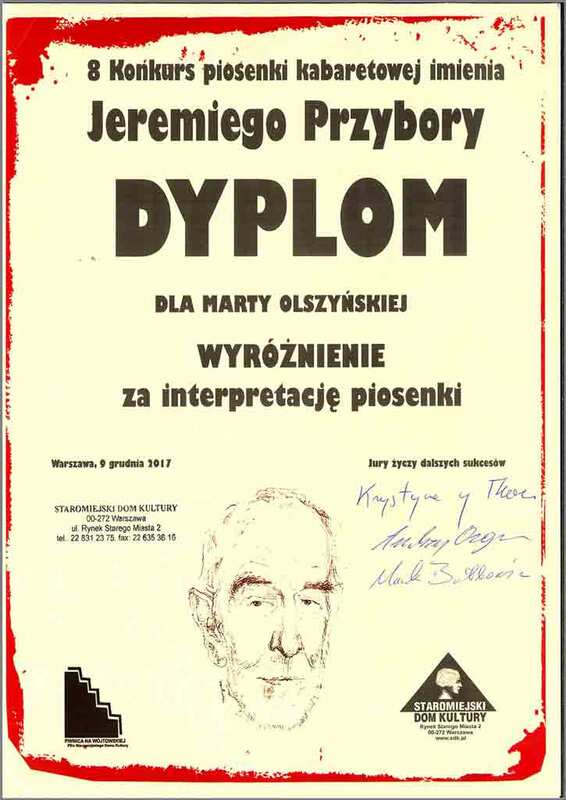 Great, pre-war traditions were continued by old, experinced teachers: Józef Śmidowicz, Paweł Lewiecki, Wiktor Bregy, Maria Haftner, Mikołaj Orłow, Zofia Drexler-Pasławska. 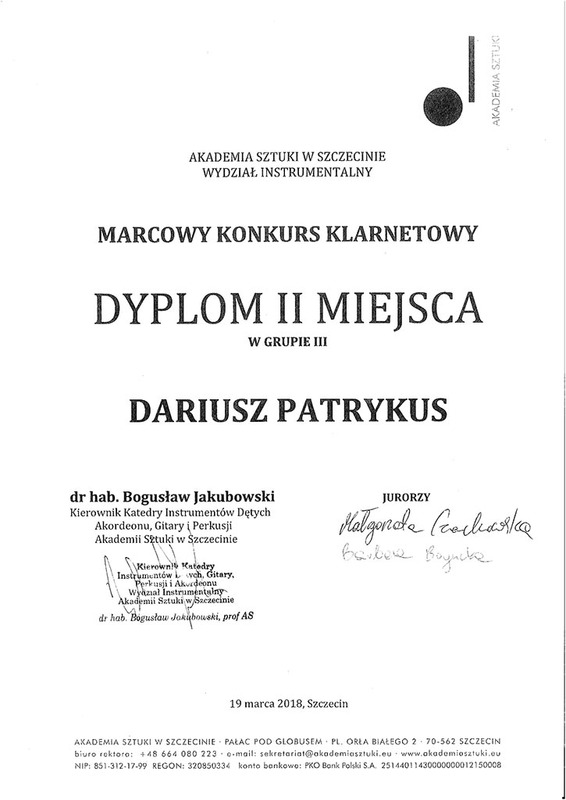 In following years the School was rapidly growing, number of students was constantly increasing, new departments and sections were being established. 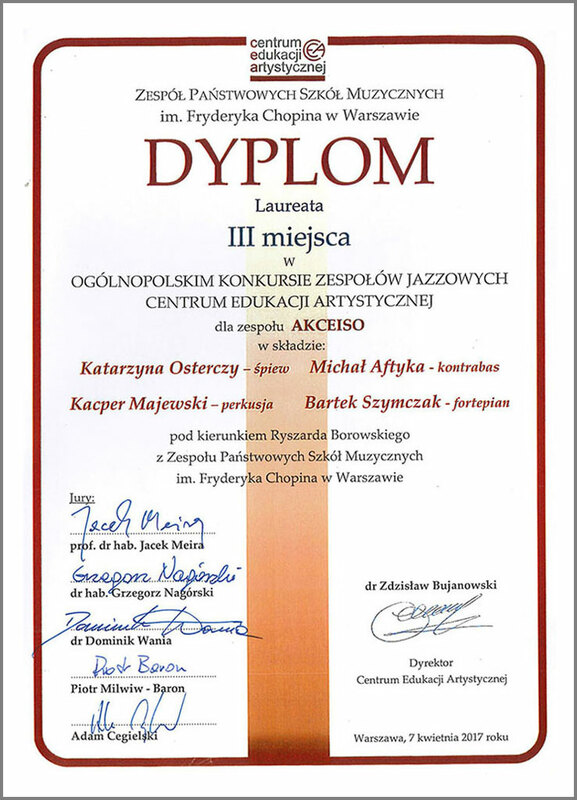 The faculty was enriched by internationally renowned Polish performers like: Irena Dubiska, Zenon Brzewski, Kazimierz Wiłkomirski i Roman Jabłoński. 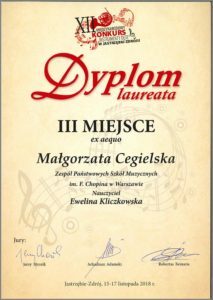 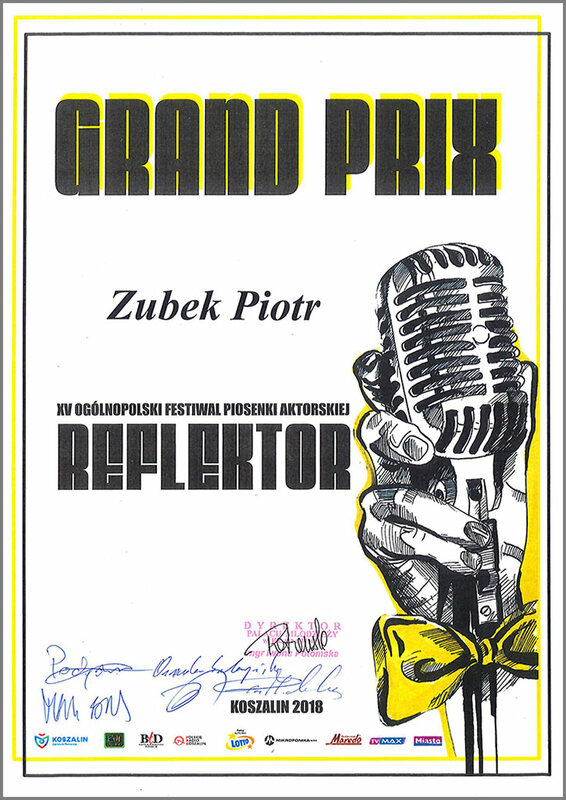 Later on many outstanding graduates accomplished notable successes on concert and opera stages in Poland and around the world. 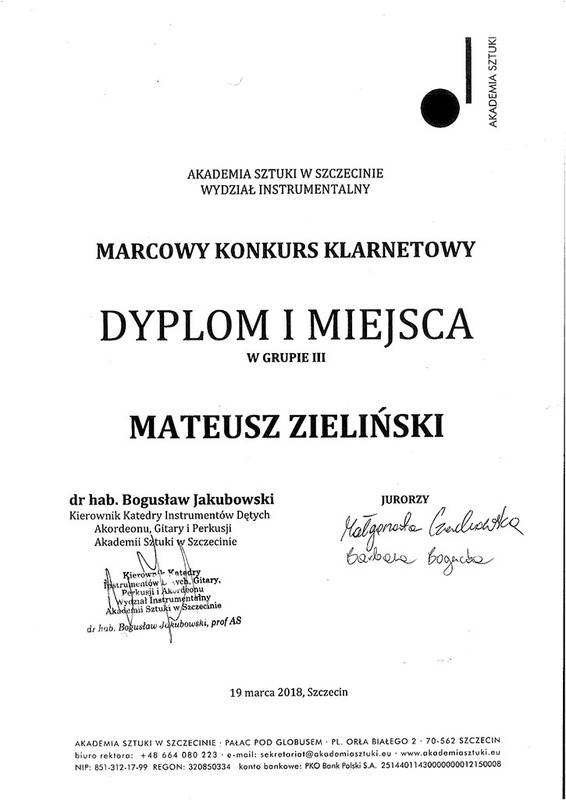 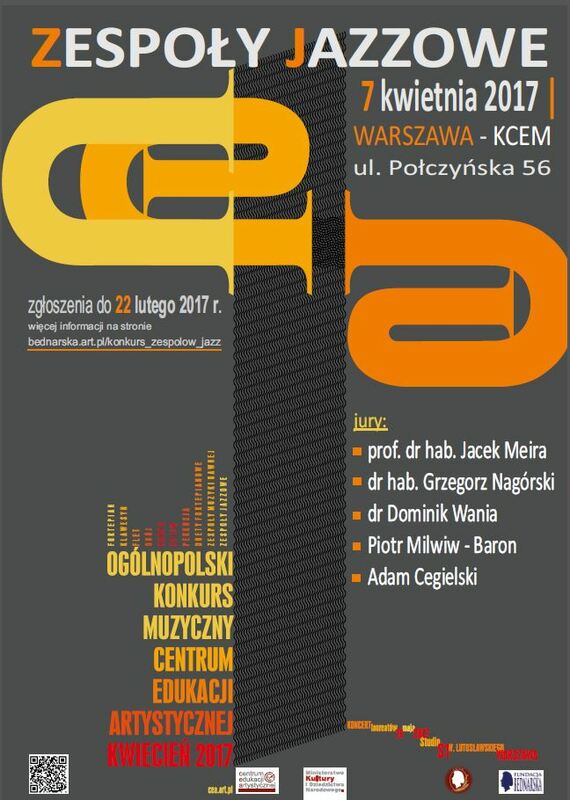 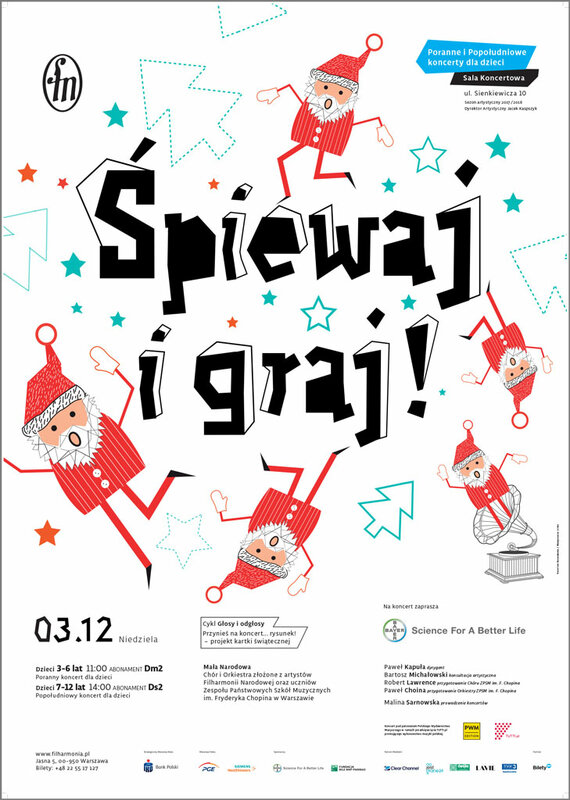 The following names can be mentioned: Zdzisława Donat, Jerzy Artysz, Jadwiga Rappe, Jerzy Knetig, Anna Malewicz-Madey, Leonard Andrzej Mróz, Jadwiga Kotnowska, Wanda Głowacka, Paweł Skrzypek, Leszek Potasiński and Sławek A. Wróblewski. 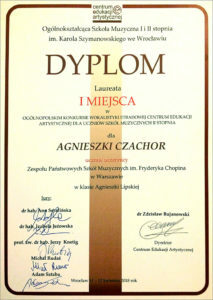 Most of them have returned to the School to join faculty staff and today they work as its renowned teachers. 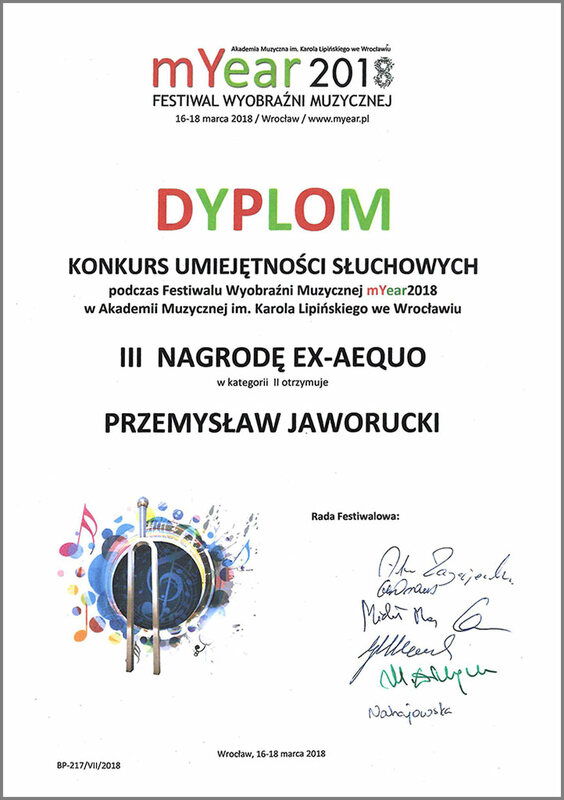 Referring to pre-war theater tradition of the School its Vocal Department has been extended by the Song Section, focused both on actors' song as well as on lighter music, pop and musical. The Song Section of Vocal Department professionally prepares singers to their career in show and entertaining business. 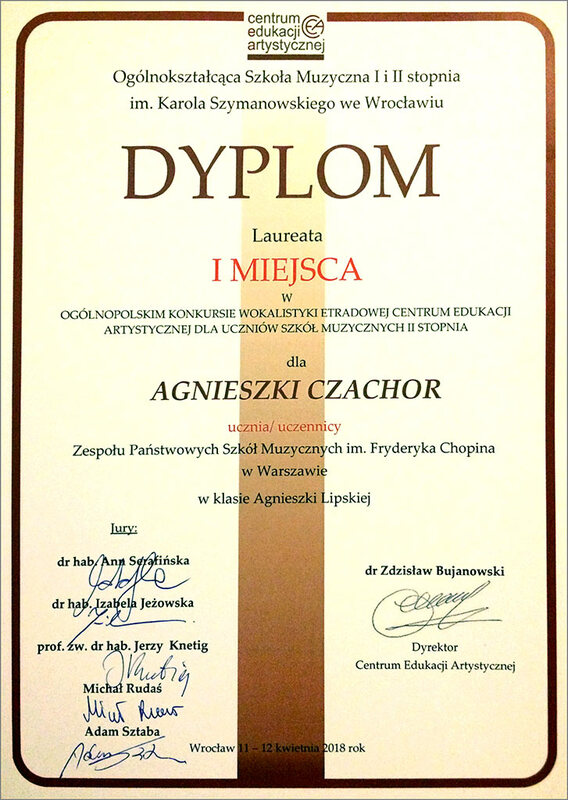 Among its graduates such popular names like Edyta Geppert and Andrzej Rosiewicz can be mentioned. 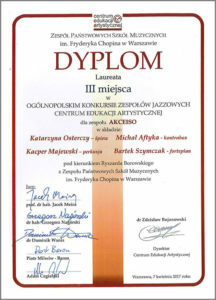 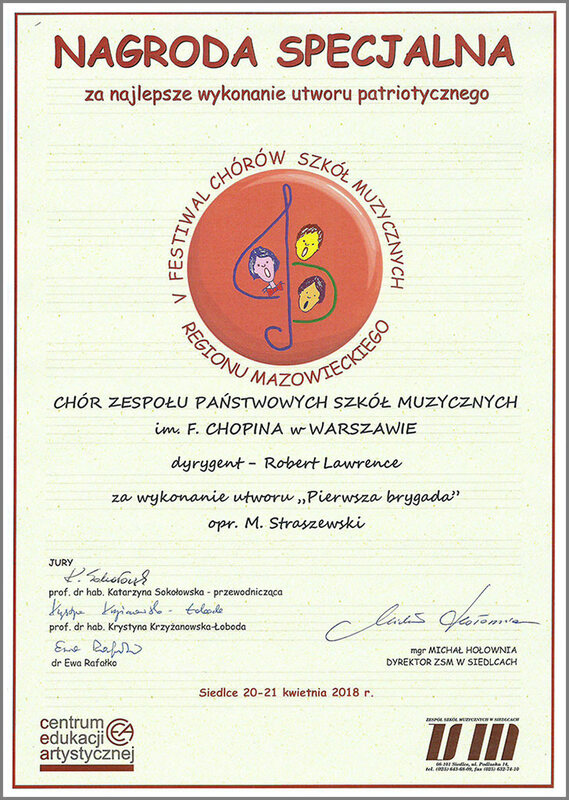 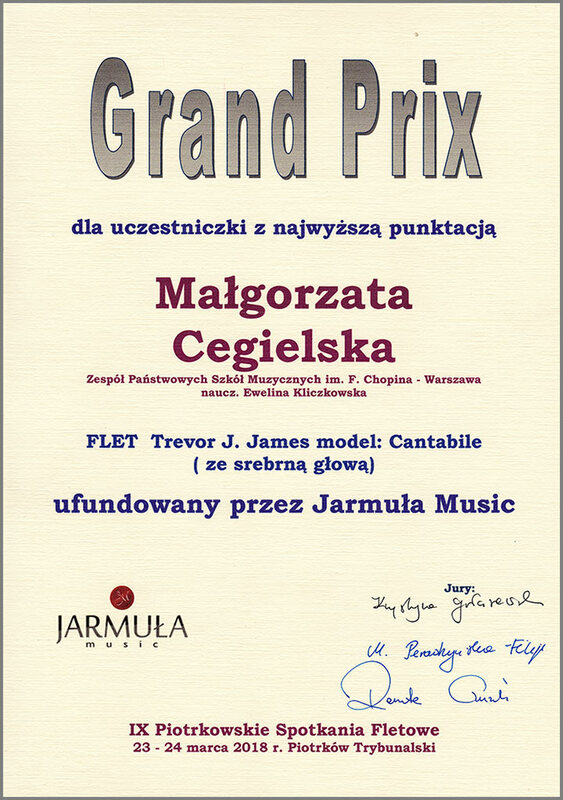 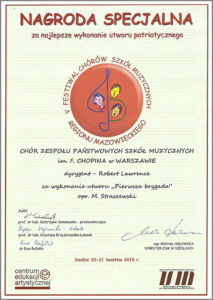 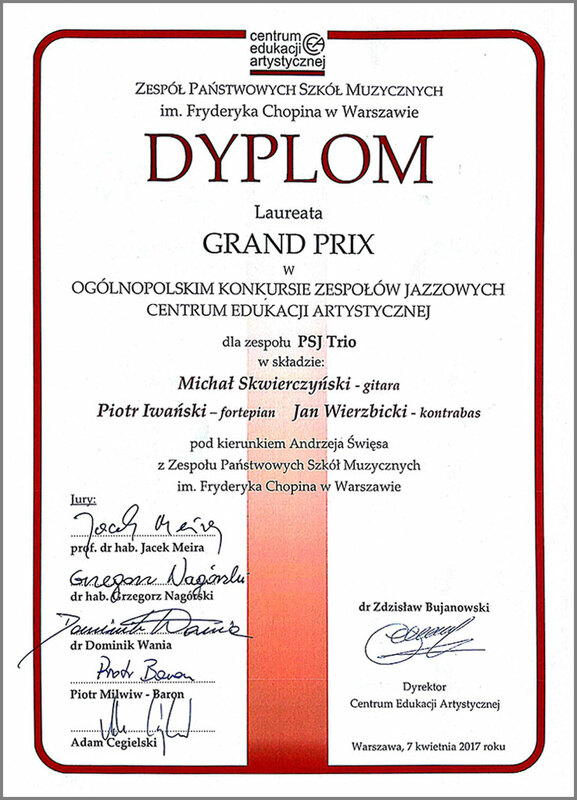 Thanks to the efforts of Mr. Henryk Majewski, the president of the Polish Jazz Society and the Frederic Chopin State Music School director, Paweł Skrzypek, in 1992 the Frederic Chopin State Music School in Warsaw inaugurates the Jazz Department with the co-operation of the best Polish jazzmen: trumpeters Henryk and Robert Majewski; saxophonist Zbigniew Namysłowski; big band leader Jan Ptaszyn Wroblewski; pianists Andrzej Trzaskowski, Andrzej Jagodzinski, Pawel Perlinski and Michal Tokaj; trombonist Grzegorz Nagorski; drummers Czesław Bartkowski and Kazimierz Jonkisz; guitarist Piotr Lemanski, as well as bassists Adam Cegielski, Zbigniew Wegehaupt and Piotr Rodowicz. 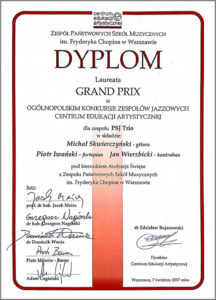 In 1997, the Frederic Chopin State Music School opened a two-year postgraduate jazz studies program that expanded the Jazz Department. It is designed for advanced music students and concentrates only on the jazz music program and thus is at a semi-academic level.